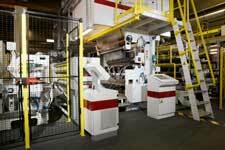 US extrusion machinery maker Davis-Standard says its dsX flex-pack line for extrusion coating is continuing to gain momentum among processors worldwide, especially against the market growth of 4.4% for flexible packaging through 2018. Rick Keller, Davis-Standard’s Vice President of Extrusion Coating and Liquid Coating also commented that the growth is especially prevalent in China, Southeast Asia and India where it has been substantial. “Demand for flexible packaging is expanding, and processors are seeking reliable equipment with a fast start-up that can adapt to changing demands. We anticipate sales to remain strong for this machine well into the coming years,” He added. Recent installations in Poland, Turkey, Saudi Arabia and China have proven the concept of this versatile machine with short installation and commissioning times. Since being introduced at K2013, the line has been installed on nearly every continent, enabling processors to cost-effectively produce all types of flexible packaging, says the firm. “The line’s unique combination of Davis-Standard’s deep experience with an efficient footprint and low pricing, has convinced a new generation of customers to trust in our know-how,” noted Chris Barton, Vice President, Sales EMEA. The dsX flex-pack has excelled in terms of extruder performance, web handling, lamination bonding, unwind splice efficiency and consistent winding. It is available in 1,200, 1,350 and 1,550 mm widths and processors are able to regularly achieve speeds up to 450 mpm, adds Davis-Standard. Converters benefit from reduced variability and better end product quality, greater uptime and productivity, less waste and lower costs, and capabilities for a wide range of applications. The latest versions of the dsX flex-pack have been adapted to provide tandem extrusion coating capabilities, further expanding the machine’s relevance in the marketplace.